UIC will have a climate of diversity and equity in which individual students, faculty, and staff feel welcomed in their identities, valued for their contributions, and feel their identities can be openly expressed wherever they live, work, and study. We must begin by knowing our campus climate as it truly is. UIC will assess the climate experienced by its staff, students, and faculty by means of a periodically reiterated survey. When we identify shortcoming, we will design solutions. Climate surveys will make a special point of considering accessibility issues that impact equal participation in and enjoyment of campus life by all individuals, including those will disabilities. 83% freshmen state that diversity was important in their decision to attend UIC. 50% of undergraduates are women. 33% of students are first-generation college students. 25% of freshmen say their first language is other than English. 49% of undergraduates receive a Pell Grant. 62% of undergraduates students receive financial aid. Source: Office of Institutional Research, Fall 2015. 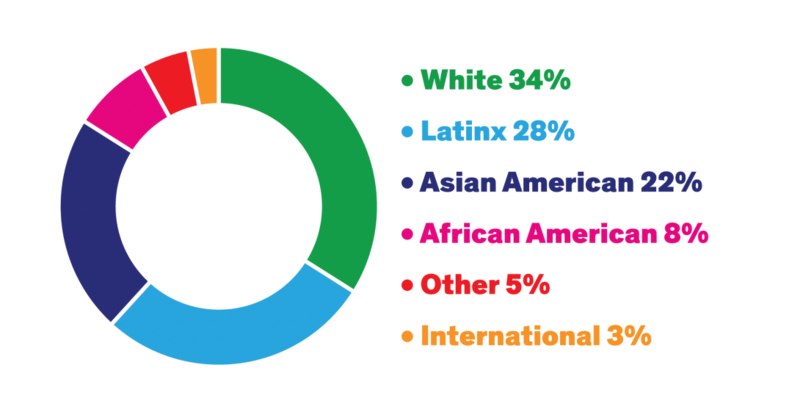 White—34%, Latinx—28%, Asian American—22%, African American—8%, International—3%, Other—5%.